An okay legal drama, this one is a little silly at times, about a lawyer who is trying his first case and evidently doesn’t know a whole lot about the law. This courtroom drama is very confused in all sorts of ways. Mainly it wants to do too much. It’s the story about a rookie lawyer who takes on a big time insurance company and all of their well-paid experienced shark lawyers, and on that basic level, everything is fine. But then the movie gets into all sorts of subplots like one about a battered wife (gotta get some kind of romantic angle in there), and another about an investigation of the illegal activity of Rudy (Matt Damon’s) boss. What ends up happening is that not enough attention gets paid to the case itself, and to the arguments being made by either side of it. There is some pretty funny humor mixed in here at times, and the movie is somewhat fun if you don’t think about it too seriously, but it also seems to not realize how many mistakes it is making, and why these mistakes are such big problems. 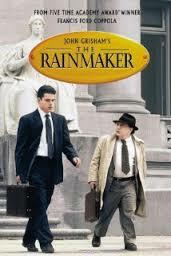 The Rainmaker is a decent john Grisham legal drama movie. There’s nothing especially great about it, but at the same time, there’s nothing terrible about it either. The movie is watchable and even somewhat enjoyable, but it never gets you truly involved or excited. That’s because the whole thing is a little too simple. Here we have a movie about a young lawyer named Rudy Baylor (matt Damon), who is fresh out of law school and trying his first case. This was also one of Damon’s first movies, coming out the same year as good will hunting, right around the time when everyone was first starting to learn who Damon was. It’s a movie directed by Francis Ford Coppola, and this one is type of film is definitely not the director’s specialty. Coppola is an interesting filmmaker. He’s like James Mangold in the way that he’s always hopping around between genres, trying to make movies that fit into categories he has not tried before. Sometimes Coppola’s films are met with tremendous success, but since his breakout films in the seventies, he hasn’t really been able to recapture the magic he once had. Back then Coppola had his gangster movie (the godfather) and his war movie (Apocalypse Now), and both here truly excellent films. But then Coppola went onto make his vampire movie (Bram Stoker’s Dracula) and now his legal drama movie (The Rainmaker), and clearly he has lost a few steps in his game. The movie has only one real thing going for it. The fact that Rudy is inexperienced and trying his first case and that it’s up against these big shot shark lawyers who have been around the block over and over again for decades. It’s kind of like the angle behind the partners of seven (the rookie and the detective working his last case before retiring), only played out on opposite sides of a court case. The trial is about an insurance company that is trying not to pay. That company is called great benefit. At the start of the movie we learn that Rudy is hard working and doesn’t have a silver spoon in his mouth the way other students he is surrounded by in law school do. He works at a bar; serving these kids who are his goofball classmates, just to make a few extra bucks. Rudy takes a job working for a man named Brewster (Mickey Rourke), who is involved in all kinds of illegal activity. It’s while working for Brewster that Rudy meets one of Brewster’s associates, Deck Shiflet (Danny Devito). This guy has not passed the bar, despite taking it over and over again, and works more like a private detective than like a lawyer. Still, he often poses as a lawyer and goes unquestioned by judges who don’t bother to check his credentials. Rudy and Shiflet go about approaching the case of a young man who is dying from Leukemia. This boy, Donny ray black, is the one who the insurance company refuses to pay. Donny’s mother, dot, started up a health insurance policy for him some years ago, and the real problem is that the insurance company refused to pay for his treatments. Donny’s condition was one that was caught in enough time so that if he got the right kind of treatment, he could have survived. Only the insurance company refused to pay. They claimed that what the boy had was a pre-existing condition and therefore it was not covered under Donny’s insurance policy. The movie is about dealing with this. The problem is that the storyline is kind of all over the place. There are subplots that have nothing to do with the case or anything in it. Claire Danes, for example, is in the movie playing a battered wife, who Rudy stumbles upon and suddenly makes his pet project. Whatever is happening with Brewster and the charges and investigation of him is another subplot that is not really explored at all. Even the case isn’t what it should be. Instead of proving whether or not the Leukemia that the boy had was indeed a pre-existing condition, or whether or not a pre-existing condition should be covered by the policy, this movie goes for the simple minded approach of focusing on an employee who was let go and of a letter that was written with harsh and unkind words, from the insurance company to Donny’s mother. None of that really proves anything. There are some moments in the film, which are fun and humorous at the same time. Danny Devito is a hoot, underplaying his role and his quiet interactions with opposing and menacing lawyer Jon Voight. But the story is where the problems are. First of all, there are way too many moments where Rudy is caught not knowing the basics of law (you have to ask to approach the witness, and can’t just go right up to her), stuff like that. For every fun or humorous part of the movie (there is a cool situation where they find out the opposing side has bugged their phones and they use this to play that side, in order to get a juror removed who they want off the case), there are plenty of moments that fall flat or seem irrelevant. The Claire Danes plot exists only to get a little romance and a female role in there. Instead, the movie would have been better served by explaining more about what Brewster was involved in and how it was going to affect Rudy. The movie definitely has it’s humorous parts and is entertaining, but it is also very much all over the place, and misdirected.